Kelowna is a city on Okanagan Lake in the Okanagan Valley, in the southern interior of British Columbia, Canada. Its name derives from an Okanagan language term for "grizzly bear". 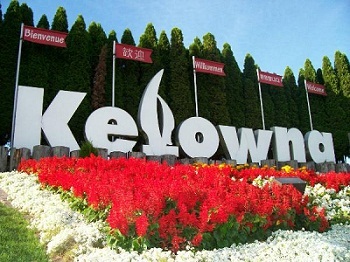 Kelowna ranks as the 22nd largest metropolitan area in Canada, with a population of 179,839 in 2011.Kelowna is a city which name derives from and Okanagan language for "Grizzly Bear". Close to Kelowna we can find the cities of Westbank, Okanagan Lake, Lake Country , Vernon as well as Peachland. SHIP MY RIDE offers several auto transport options for you in Kelowna when it comes to car shipping experience for example SHIP MY RIDE provides terminal-to-terminal car shipping service and door-to-door auto transport service, we also provide vehicle rail transportation in Canada and the United States, so you don’t have to worry about anything on auto shipping. Let us do all the work for you. SHIP MY RIDE is a car carrier company certified by the Auto Transport Association being a platinum member since 2009. Being a certified auto transport company is a signal of the quality in the service SHIP MY RIDE PROVIDES. If you are looking for a car shipping company in Kelowna, SHIP MY RIDE is what you are looking for. We will give the best auto transport service in Canada and the United States. Quality is first in SHIP MY RIDE. If you have any questions or doubts about how the vehicle transport service works in Kelowna, you can email us to "info@shipmyride.com", as well you can receive online assistance in our website or you can call us to our toll free number: (403) 800-9292. We will be more than glad to assist you here in SHIP MY RIDE. You can ask us any question about our auto transport quotes, how we load and unload cars, timeframes in the delivery of a vehicle or truck and more.